If you are not new to loss, talk a bit about early grief. What was it like, clinging for hope in the pits of despair? What did you cling to for hope? How did you survive the early days? What helped? What do you wish you could share with someone new to this walk, clinging in the pit? If you’re in the pit, currently, share your struggles. What can others do to encourage you? "Hannah Rose, this is where her heart is. And it's not beating anymore...I'm so sorry." What? How could that be? Is this just a nightmare? When will I wake up? I just want to wake up! But, I didn't wake up. It was real. I was so utterly shocked and frantic that I couldn’t cry at first. God, can I please have her back?! But, there was nothing my doctor could do and there was nothing we could do...just cry. My little girl was gone. 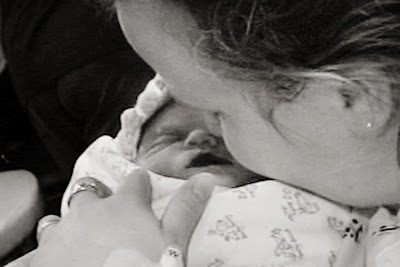 Deep belly sobs rattled me to the core and for the second time in my life, I felt that ache in my heart that comes from knowing my child is in the arms of the Lord, rather than here with me. I felt myself perishing under the weight of this suffering, suddenly overwhelmed with the truth that I couldn’t carry such a burden alone. With all that was in me, I reached out and begged for strength from Emmanuel, God with us, like I had nothing else to help me live. I reached out and touched His face. He was with us. And He freely offered the supernatural peace and strength that flooded over me in a way I had never known. The presence of the Most High God moved through room 235. He gave me the strength to give birth to her, to hold her and spend those sacred hours with her, and then to kiss her goodbye...for now. I needed more strength as I left the hospital with empty arms and a broken heart. I needed it when I planned my daughter's Celebration of LIFE Service. I needed it when her tiny white casket, placed inside her cozy green Moses basket was placed in the ground and covered with tears, rose and lily petals, and dirt. I needed it when I came home and life marched on, as if she had never existed. I needed it when others so soon forgot her and my grief. I needed it as the days, weeks, months, and now years passed without my precious child here with me. I have needed it in the times that I have yet again fallen into the pit of sorrow and grief. I have needed the strength, grace, peace, and hope of the Lord every day since I took that pregnancy test, confirming I was expecting a little babe at age 19. Through my experiences, I have learned one of the greatest lessons of my life...The Lord has shown me that He desires me to live each and every day like March 16th, 2010. Desperately relying on Him for everything and knowing I am helpless without Him. Depending on His strength and trusting fully that He is sufficient for me. Every moment of my life, whether full of sorrow or joy, should be spent at His feet. He desires to be a part of all aspects of my every day. He is using me, weak Hannah Rose, to show others how He can provide strength to get through any and all things, when you call out to Him and depend on Him. Me, terrified of child birth, never thinking I'd have to birth my deceased child. I stand in awe, totally amazed, that I got through all this. At times, I find myself looking back on everything I've been through and almost not believing it really happened to me. I find myself wondering how I did it all. And He gently reminds me, you didn't do it. I did it through you. And I smile to myself and think, ah, yes, my precious Jesus, there through it all. And I realize I wouldn't have the strength to get through that today. I feel so weak. He reminds me that no, I don't have the strength to get through it today because I don't need the strength to get through it today. My mind goes to a conversation Corrie ten Boom (one of my spiritual heroes) had with her father as a young girl. Fear had come into her heart as she thought of the possibility of her father dying and she thought she couldn't live without him. Her father, Casper, then asks her, "Corrie, when we go to Amsterdam, when do I give you your train ticket?" "Why, just before we get on the train," she answered. "Exactly. And our wise Heavenly father knows when we're going to need things too. Don't run out ahead of Him, Corrie. He will give you the strength you need, just in time." So many people have said to me they don't know how I've gotten through this and that they never could. It was never me, but my Jesus and I pray my story points all hearts to Him. I pray whoever hears this story will not walk away thinking Hannah Rose, or Lily even, but Jesus, Jesus, precious Jesus, for it is He for whom every heart is longing. I pray you will see that He gives us what we need the moment we need it, not a second before or too late. His "train ticket" of grace is there for us to face things we could never imagine facing before. It doesn't make things easy or take away the pain, but somehow it is sufficient to bear what would otherwise crush those who have not made the Lord their hope. Don't expect to understand or know today what you may face tomorrow. Each day has enough trouble of its own. ~Matthew 6:34 If you're called upon to face something unimagineable, rest assured that grace ticket will be handed to you by our loving Father the moment you get on the train, not a moment before. God's strength is there for us when we need it and is not overcome by our circumstances. Count your weakness as a joy, a gift because it can draw you to Him and He can prove Himself faithful in your life! If you are new to this walk of grief and are deep in the pit as you read these words, know there are others who have gone before you and others who are walking with you now. Know that the Lord will hold your hand each step of the way. He will never leave you or forsake you. As Corrie ten Boom says, "There is no pit so deep that God's love is not deeper still." Just because you are in the pit does not mean the Lord is not right there with you, extending His hand to you to pull you out. Don't feel like as a Christian, you are not allowed to experience sorrow and grief. The shortest verse in the Bible is John 11:35, which says "Jesus wept." The Son of God Himself experienced great emotion. It shows His tenderness as our Friend and our Father. It is not improper to weep and is an expression that God does not forbid or condemn. We just must be careful not to harden our hearts towards God because of our grief, but keep our hearts tender towards Him. We must mourn with submission to God. There may be pain, there may be sorrow, there may be winter...oh, but in Him, we have the hope and the certainty that joy and spring are coming! With spring, comes new LIFE, fresh hope. Even here on earth, the Lord is bringing beauty from ashes. There is spring even here, in this fallen world. He uses all things together for our good (Romans 8:28). He brings new life out of tragedy and heartbreak. May we each cling to the HOPE that's Christ. May we cling to the promise that He can and will bring beauty and spring out of sorrow and winter. Both here on earth...and for all eternity. Spring is coming. Hallelujah! I highly recommend getting the "Beauty Will Rise" album by Steven Curtis Chapman. It is one of the instruments the Lord has used mightily in my healing. It flowed out of the loss of his own precious daughter. If you are reading this and you are the friend of family member of someone who has lost a baby, be there for them. Romans 12:15 instructs us to "rejoice with them that do rejoice, and weep with them that weep." If you are looking for other ways to show your support through the loss of one's baby, click here. Next week, I will discuss more practical things that the Lord used in my life to bring me to healing. To read more about my healing journey with Luke Shiloh, click here. I suppose it shouldnt amaze me, but it always does...the things that the Lord will bring us through. Just when you think you have reached the brink of your sanity He pushes it forward. Im so thankful to have had Him to lean on...and that he was such a comfort to you as well! I dont know how anyone gets through the loss of a child with out him. Thank you so very much for sharing this week! So very beautiful and true! Jesus is always there for us, waiting. Waiting for us to cling to Him! Thank you for sharing! I stinkin' love this post, dear Hannah! Amazing! I love Corrie Ten Boom also. So much wisdom and truth. That story about the train ticket. Loved when her father gave her that analogy...just like our father does for us...He gives a measure of grace just when we need it. At just the right time. Just enough. Sufficient grace...always sufficient. I too felt his presence filling the room as Thomas went from my arms to the arms of Jesus. One of the most amazing moments of my life....still...and always. Thank you for this beautiful post! Loved every word. Thank you for the reminder that we do not need to be strong enough to make it through the day, that our Lord will give us what we need at the time that we need it. He is so good! Such a beautiful tribute to Lily and to the Lord! I, too, felt God's presence in the hospital room when I held Gabriel's lifeless body. I knew He was there and though it took me a few weeks to find Him again, I'm so grateful to have faith and understanding that God will always provide for us. Wow, Hannah! I love the HOPE in your words. Something beautiful out of something beyond awful. You speak to the value of presence - God was there for you, is here. And the reminder to those supporting people enduring loss - be there for them. Be present. God certainly does use you to show His strength! You are an amazing testimony and you give so much hope and light through your words even in such tragedy. Bless you!